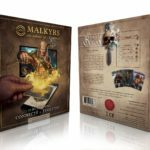 It has only been a few weeks since we talked about Malkyrs, an interactive card game that uses the NFC functionalities of your phone, or a NFC reader if your phone does not have a reader. The game combined real cards with an online experience, which proved to be interesting and very simple to get into. 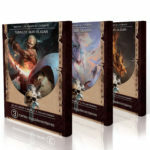 The game allows you to choose a champion, and build a deck comprised of out ten cards of varying rarity. Each card can be used several times in the heat of battle, and it’s up to you to know when to strike, to defend or simply go all out and stomp the competition. While the English version of the cards are still very much in production, we have the chance to offer two French introduction packs (Daeris and Lyceran) and three booster packs, allowing you to tinker a bit with said introduction packs. While the cards may have a French print, which is often not more than a title or a name of the card, these cards will simply scan as the English variant when you use them in combination with the game and the NFC app. This means that even though the title of the card may sound like something exotic if you’re not into French, you can perfectly use these cards to strengthen your English set of cards, or simply to try out the game. If you were to be added to a card game as a champion, what would your special ability be? You can send your answers to info@3rd-strike.com until the 10th of February 2019. The winner will receive a reply to their mail the 11th of February.